« Who do you blame when you have to shovel your sidewalk? Make Friends with Developers, Maybe They’ll Name a Street After You! 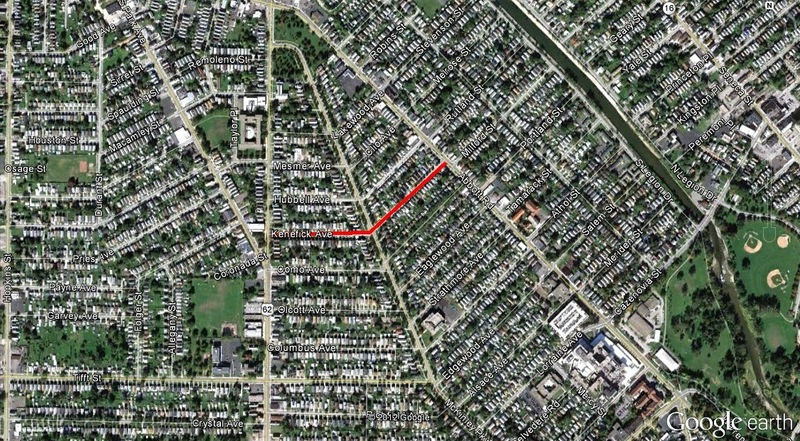 Kenefick Ave is a street in South Buffalo running between South Park Avenue and Abbott Road. The street was named after Judge Daniel J. Kenefick. Judge Kenefick is the author of the Buffalo City Charter, which was written in 1927. Judge Kenefick was born in the Old First Ward in 1863. He attended Buffalo City Schools, graduated from Central High School in 1881 and studied law in the Buffalo office of Congressman Richard Crowley. He served as assistant district attorney and district attorney of Erie County and also was Justice of the New York State Supreme Court. He served as director of the Buffalo Niagara Electric Company. The Judge lived at 841 Delaware Avenue, at the corner of Barker Avenue. 841 Delaware Avenue is the current location of the Himalayan Institute, but I am not 100% sure that this is the same building which the Judge lived in. Judge Kenefick grew up in the Old First Ward. He married Maysie Germain of the Germain Family of Buffalo. He grew up alongside developer John F. Burke. Mr. Burke grew up to become a developer and developed the part of South Buffalo where Kenefick Avenue is located. Mr. Burke honored his boyhood friend by naming Kenefick Avenue after him. Biography of Daniel Kenefick. Our Country and It’s People: A Descriptive Work on Erie County, New York. Edited By: Trumen C. White. The Boston History Company, Published 1989. “Kenefick Avenue Among Few City Streets Honoring Living Citizen”. Courier Express, October 9, 1938, sec 5 p 2. It is true that 841 Delaware is where the Himalayan institue is currently situated. My house is located at 75 Barker Street, directly behind the institute. The history that I’ve got on my house indicates that Judge Kenefick lived in the house until 1950. The same history says the house was built in 1914 by Charles Brown Sears, also a judge and the person for whom the UB Law LIbrary was named. My own research has uncovered documentation that a building permit was filed by prominent architects Esenwein and Johnson in the name “Sears, Chas B” 10/24/1907 for 849 Delaware Avenue. That address is currently the site of a high-rise condominium. The records of Esenwein and Johnson are in the historical society, and I hope to be able to look them up over my vacation time next week. I think the evidence indicates that the Sears House at 75 Barker Street was likely the house indicated in the building permit for 849 Delaware and was almost certainly the house that Justice Kenefick lived in. It’s possible that the property had a Delaware Avenue address when it was originally built. That would have been a desirable address at the time! The property may have been given new addresses as parts of it were sold off. There doesn’t seem to be any history on the HImalayan Institute that I can find online to corroborate that it was built later than my house. Very interesting! I’ve seen your house, I’ve always liked the old colonial style feel of the house. It would make sense if it was on the corner and they decided to give it a Delaware address…everyone wanted to be a part of Millionaire’s Row, right? And lots were likely a lot larger then too. Thanks for the information! I hope you have good luck researching at the historical society…if you don’t know her yet, Cynthia the librarian is great and very knowledgeable! Another thing to do might be to check out the Sanborn Maps from around that time to see if where the buildings were located at that corner around that time. The Buffalo Library has some of the maps available online, let me know and I can show you how to access them. I’d be interested to hear what you find out….feel free to comment back or email me at buffalostreets@gmail.com. Thanks! The Sanborn maps have complicated this story 🙂 They do show a house at 849 Delaware Avenue in both the 1889-1900 and the 1915 versions of the maps. The house at 75 Barker appears in the 1915 map and not on the 1889-1900 map consistent with the time I think it was built. It looks like Judge Sears did in fact live at 849 Delaware and not in my house at 75 Barker. As for Judge Kenefick, I have no idea 🙂 I am certain I can’t trust the history I have on this house and will have to start from scratch. If I uncover any relevant information I’ll pass it along. Oh wow! Very interesting! I wonder if it’s possible that maybe Judge Sears built a house on Delaware and then later built the 75 Barker House later? Although their dates of construction within a decade or so of each other seems too close for that to make sense. Especially if you’re having a well known/respected architecture firm design your house. Hopefully the Enswein and Johnson records can shed some light on it for you. Fascinating! That is possible. The house on Delaware predates the E&J permit, although the permit could have been for anything. The records may have the answers. I think I’ve solved this mystery as far as Judge Kenefick is concerned. I have found a 1922 directory entry for him at 75 Barker Street, previous to that he’s listed at a Front Street address. So, Judge Kenefick did live in my house. Since the house does appear on the 1915 map it seems unlikely that he built it. This is my relative! He was my grandmother’s uncle!